I can't choose multiple packages? like for Bioshock Infinite, I want to click all the packages and let it extract. 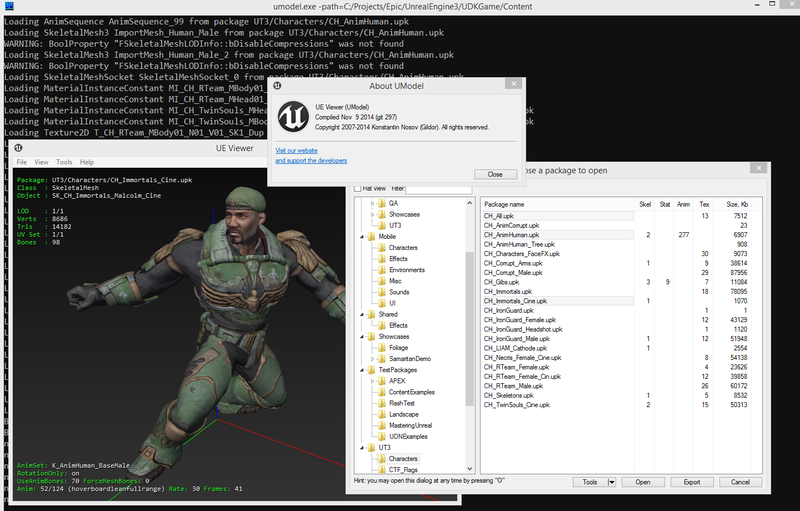 When I press extract for any package, it will load the first texture it finds and show it in the "viewer" thus stopping the extaction process permanency. Example of what I mean is in the picture. I can't choose multiple packages? When I press extract for any package, it will load the first texture it finds and show it in the "viewer" thus stopping the extaction process permanency. Very strange. May be you double-clicked on package name instead of pressing "Export" button? Not sure about "all packages", but at least multi-selection will appear later. The export thing was a user error, not the program. But the only thing that's weird is that the program opens a texture at the end of the exporting, why not close out the console and display a message saying "Export complete!" cause when the texture opens in the viewer, I think there is still more to export but there is not. Umodel will automatically close only when if you're starting it from the command line and no UI appears. But I decided to keep it working after exporting with UI in a case if user wants to export another package - he can simply push <O> button and load or export another package. Ah okay, cause that's what gets me is when a texture pops up in the viewer, I think there is still more to extract but there is not. I can run Umodel from the command line? would I be able to use the batch extract file with the command line? Sure, full previous functionality remains in place. UI appears only when user enters a command line which didn't do anything useful before - for example, when user forgot to put -path=... or forgot to add a package name. By the way, you may enter full correct command line, and add "-gui" option - this will force umodel to pop up the startup dialog anyway. Some UI update. Package list now has "flat" mode (see the checkbox on top of the window). In this mode, all packages are displayed in single list without a directory tree control on the left. Also I've added a "filter" text field - when it's not empty, package list will contain only files which names contains entered string. This work was done as a prerequisite for multiselection of packages in list for either viewing or export. Major update. Now you can select multiple packages from UI in either load them for viewing or export. Please note that I completely rewrote a large amount of code which wasn't changed for a few years, so I'm expecting bugs or even crashes, despite I did some tests by myself. Feel free to report any problems here. Today I've implemented a progress window for loading and exporting packages. You may abort current operation at any time by pressing <Esc> key or by pushing "Cancel" button. Is there any option that after closing "UE Viewer" the GUI and app will back instead of closing? Closing a window closes an application. Isn't it standard behavior? Otherwise how do you assume to close umodel? Probably you didn't read my posts about GUI and didn't notice a message at the bottom of "package selection" dialog: you may press "O" key at any time to pop up this dialog again.